O God, who chose the Bishop Saint Patrick to preach your glory to the peoples of Ireland, grant, through his merits and intercession, that those who glory in the name of Christian may never cease to proclaim your wondrous deeds to all. Through our Lord Jesus Christ, your Son, who lives and reigns with you in the unity of the Holy Spirit, one God, for ever and ever. 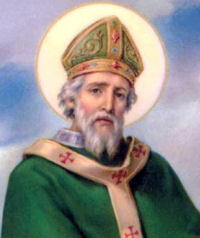 Not many facts are known about the life of St. Patrick. We know that he was born around 415 AD, and was a Roman Briton. When he was about 16, while he was tending his sheep some Irish raiders captured him and made him a slave. He eventually was able to escape and return to Britain. There he heard the call to return and bring Christianity to Ireland. He was ordained a priest, consecrated a bishop and came back to Ireland around 435 AD. Many legends are associated around St. Patrick: how he drove the snakes out of Ireland, and the use of the shamrock to teach the mystery of the Trinity. Whether or not the legends are true, St. Patrick succeeded in bringing Catholicism to Ireland, and in time, the whole country converted from their pagan gods to the one true God. Although a small country, Ireland has played a large role in saving and bringing Christianity throughout the world. During the early Dark Ages, the Irish monasteries preserved Western writings while Europe remained in darkness. But as the Catholic country remained solidly Catholic, the Irish spread the faith to all corners of the world. To learn more on this subject, read Thomas Cahill's How the Irish Saved Civilization. I am greatly God's debtor, because he granted me so much grace, that through me many people would be reborn in God, and soon after confirmed, and that clergy would be ordained everywhere for them, the masses lately come to belief, whom the Lord drew from the ends of the earth, just as he once promised through his prophets: "To you shall the nations come from the ends of the earth, and shall say, Our fathers have inherited naught hut lies, worthless things in which there is no profit." And again: "I have set you to be a light for the Gentiles that you may bring salvation to the uttermost ends of the earth." Patron: Ireland; against snakes; against ophidiophobia; archdiocese of Boston, Massachusetts; diocese of Burlington, Vermont; engineers; excluded people; fear of snakes; diocese of Fort Worth, Texas; diocese of Harrisburg, Pennsylvania; archdiocese of New York; Nigeria; diocese of Norwich, Connecticut; ophidiophobics; diocese of Portland, Maine; diocese of Sacramento, California; snake bites. Symbols: A bishop trampling on snakes; bishop driving snakes away; shamrock; snakes; cross; harp; demons; baptismal font. This is a good day to honor St. Patrick by trying typical Irish fare: corned beef and cabbage, soda bread, scones, stew, Shepherd's pie, potatoes in various forms and the famous beer and spirits of Ireland. For dessert, try making the Irish Porter Cake. Read the Lorica (Breastplate) of St. Patrick. Here is an older translation — pray it with your family after your rosary tonight. From the Catholic Culture library: The Conversion of Ireland by Warren Carroll, The Irish Soldiers of Mexico by Michael Hogan, The Irish Madonna of Hungary by Zsolt Aradi and Our Lady in Old Irish Folklore and Hymns by James F. Cassidy. Today's Station is at St. Nicholas in Prison. It was constructed in the ruins of two temples and the ancient Forum Olitorium, and you can see fragments from them reused in the church. The most important of the temples was the Temple og Piety, built by Acilius Glabrius, consul in 191 B.C. The dedication to St. Nicholas was made by the Greek population in the area.